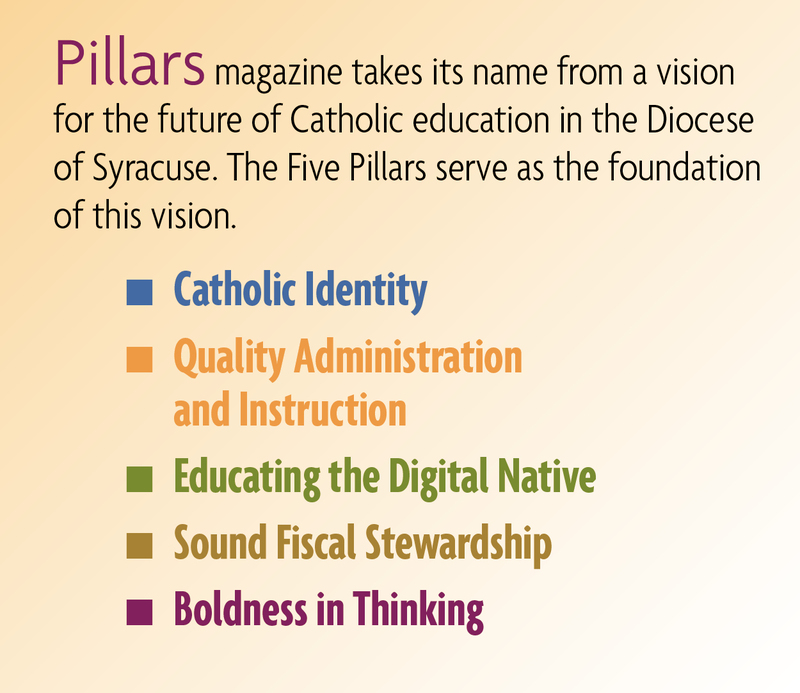 For the past ten years, the Diocese of Syracuse Catholic Schools Office has made a point of honoring individuals who are committed to the mission and success of Catholic School education at its annual Light the Way Dinner. The dinner has been a traditional kick-off celebration for Catholic Schools Week. The event has grown in size each year, with over 500 in attendance in previous years, and proceeds from the dinner are used to provide financial support to families of Catholic School students in need of tuition assistance. In the past, the event has raised hundreds of thousands of dollars. Over the years, several awards have been presented at the dinner, including the Witness to Faith Award, the Superintendent’s Award, the Distinguished Alumni Award and the Light the Way Award. The Witness to Faith Award is presented to a Catholic school educator who is not only a teacher or a professional who instructs and offers knowledge to students, but helps with the overall development and enhancement of faith in others. Previous honorees have included Peg Brown, former principal of St. Patrick’s School in Oneida (2011); Sr. Anna Mae Collins, CSJ, principal of Notre Dame Junior/Senior High School in Utica (2012); Sally Lisi, principal of Immaculate Conception School in Fayetteville (2012); Rev. Richard P. Morisette of St. Stephen the King Church in Oswego (2015); and ADAPEP Counselor Patricia Schramm of Bishop Ludden Junior/Senior High School in Syracuse (2015). The Superintendent’s Service Medal is presented to a member of the school community that has volunteered a significant amount of his/her time and talent to help others. Past honorees include Mary Ellen Salanger, a member of the Board of the Catholic Education Foundation of the Southern Tier who volunteered countless hours to help Broome County Catholic Schools (2011); Dr. Jennifer Redmore of St. James School, Johnson City (2014); and Ann and Dave Keeney of St. Mary’s Academy in Baldwinsville (2014). The Distinguished Alumni Award honors an alumni of a diocesan Catholic school who has “successfully used the values they learned in Catholic school to make a positive impact on the world,” and remains connected to helping support and promote Catholic education. Previous honorees included Michael D’Avirro, Bishop Grimes Class of ’78 (2011); Lucy Paris, Bishop Ludden High School Class of ’73 (2013); and Terry Gallagher, Broome County Catholic Schools Class of 1989 (2014). Previous winners of the Light the Way Award include Sr. Mary Anne Heenan, CSJ (2011); Connie Berry, former editor-in-chief of The Catholic Sun, (2014); and in 2015, in celebration of the Year of Consecrated Life, the diocese honored approximately 21 sisters and their religious orders that have consistently supported the Catholic schools in the Diocese of Syracuse, with the Light the Way Award. In 2016, to celebrate the 10th anniversary, the Light the Way Award honorees will be individuals who have provided 40 years of service or more to Catholic Schools. The decision to honor this group came as a direct request from the faculty throughout the diocese, who felt this group deserved to be recognized during this special anniversary.